When you mention tow trucks most people imagine an over-sized pickup with a boom, cable, and hook on the back. But that’s actually an older and less-capable configuration. Here’s an overview of the various different types of tow trucks and what they’re good for. It just might come in handy the next time you need to call for a wrecker. Also called wreckers, here are the most common types of tow trucks. The different types are determined by how the vehicle is hooked up, and there are various combinations of these types’ features as well. Tow trucks are also categorized by their weight capacity. We’ll introduce that in the next section. Hook and chain tow trucks were the earliest wreckers, quite literally attaching to the towed vehicle with a hook & chain. That often resulted in body or other damage. So today’s smaller wreckers use some combination of a tow bar, rubber mats, and belt lifts. They should actually be called boom trucks, but the old name tends to stick. Wheel lift tow trucks have a large metal yolk that’s placed under the vehicles drive wheels. A hydraulic lift raises those wheels off the ground so there’s no wear or risk of damage to the differential. Integrated tow trucks, also called self loaders or snatchers, combine a boom and wheel-lift into one unit. They’re fast to hook up, so they’re often used for repossessions. If you want to get picky, flat bed tow trucks don’t actually tow vehicles. They carry them on a large flat bed instead, carrying the full weight of the vehicle. They’re now among the most common as they can handle a wide variety of vehicles, from motorcycles to SUVs. Plus being lashed down by the tires, the vehicle is completely immobilized so there’s no wheels turning (important for 4-wheel drives), no bumps and jerks. They’re also ideal for heavily damaged and won’t-roll vehicles. A winch pulls the car or truck up a ramp, or better still the flat bed tilts up at the front for direct loading. 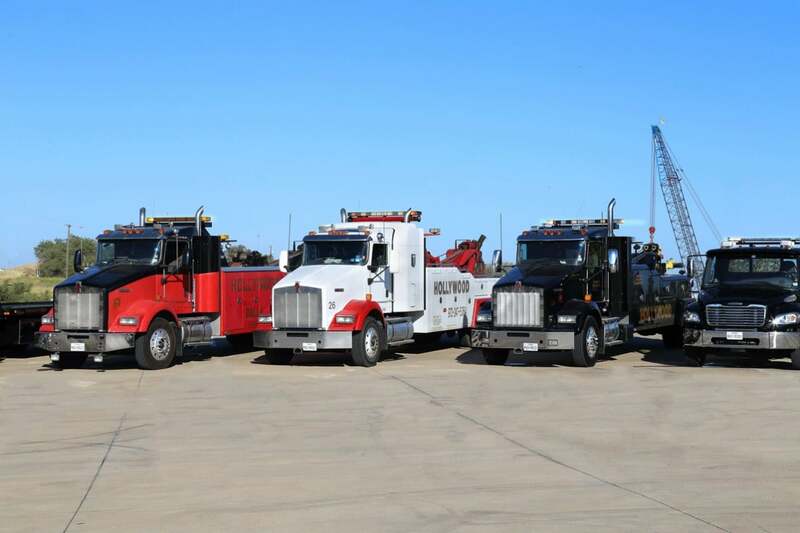 These are the biggest and baddest of wreckers (and arguably the star of the TV series “Highway Through Hell”). They’re like a big construction crane with a boom that can rotate 360 degrees and can extend to some 30 feet. That gives them the strength and flexibility to handle the toughest situations. But costing upwards of $400,000 there’s not very many around. When you call for tow truck service, the first question besides your location is the type of vehicle. That tells the dispatcher what types of tow trucks are suitable. The different sizes also have different requirements for driver/operator licenses. Light duty towing vehicles are compact and maneuverable, with a lower overhead clearance required. With towing capacities of 5-10 tons they’re limited to sedans, light trucks, and smaller SUVs. Medium duty towing wreckers include most flat beds, and have a capacity of 15-20 tons. Heavy duty towing wreckers are built with chassis based on semi trucks and have capacities of 25-50 tons. Rotators commonly go up into the 50-75 ton range. You can typically trust a wrecking company to send the right truck. But now that you know the basics, don’t be shy about double-checking with the dispatcher. I was very impressed with how timely the service was. Mr. Dag arrived 30min earlier than expected. The car was loaded in no time. The atmosphere on the way to our destination was welcoming. I as a customer am truly satisfied.